"This is my favorite pie recipe anywhere. Just make sure you use only fresh, high-quality sweet peaches." Preheat oven to 425 degrees F (220 degrees C). Butter a 9-inch pie dish. Place 1 1/4 cups flour, butter, salt, and 2 tablespoons sour cream in a food processor; pulse until mixture comes together in a large ball. Press dough into prepared pie dish to form a crust. Bake in preheated hoven until golden brown, about 10 minutes. Remove pie crust from oven. Reduce oven heat to 350 degrees F (175 degrees C). 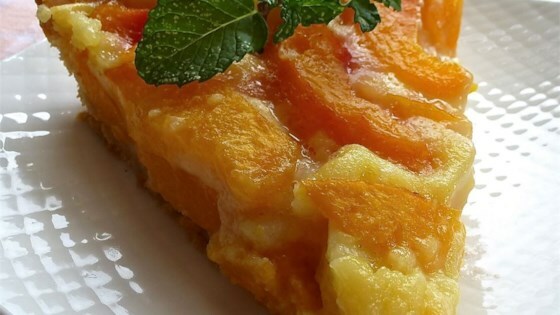 Arrange peach slices in pie crust. Lightly beat egg yolks in a large bowl. Add in sugar, 1/3 cup sour cream, and 2 tablespoons flour; stir until well-mixed. Pour egg mixture over peaches. Cover pie with aluminum foil. Bake in preheated oven for 50 minutes; remove foil. Continue baking until peach filling is set, about 15 minutes more. I have made this recipe for YEARS. Only we call it Peach Torte! Doubled recipe goes into a 9 x 13 pan. I sprinkle the top with cinnamon. Really good with apples,too!